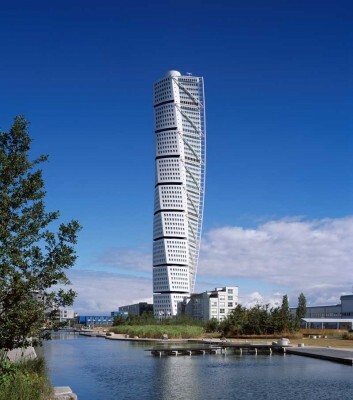 In 1999, Santiago Calatrava was invited to design a mixed-use residential tower for a prominent site in Malmö’s Western Harbor area, with the plans to be exhibited in the European Housing Expo 2001 (Bo01). The project was envisioned as an important part of the transformation of Malmö’s Western Harbor near the Öresund Bridge, which connects Sweden and Denmark. Once a decaying industrial area, the Western Harbor is rapidly becoming a mixed-use residential district and today features housing, restaurants, shops and businesses, a marina, and Malmö University. Given the opportunity to enhance and enlarge a public area that is defined by the intersection of two main roads, Calatrava conceived of his project as a freestanding sculptural element posed within the cityscape. He based its form on one of his sculptures, Turning Torso, in which he abstracted the human form in movement as a stack of cubes elegantly positioned around a core. In the original sculpture, seven cubes are set around a steel support to produce a spiraling structure. 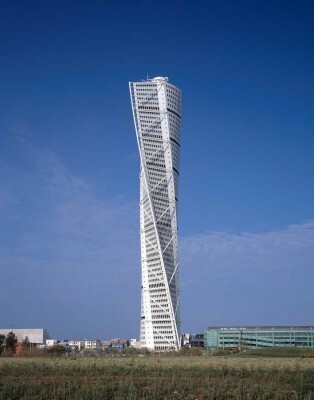 In HSB Turning Torso, the form is composed of nine box units, shaped like cubes with triangular tips. These units, each of which houses five floors, are in effect “sub-buildings” of about 2000 m2 (21,500 sf). The space in between the units is used as technical space for facade maintenance. The equivalent in the tower of the sculpture’s steel support is the nucleus of internal elevators and stairs, through which the units communicate. The result, at 190 meters (623 feet), is the tallest residential building in Sweden and the second tallest residential building in Europe. From its top, a visitor may see Copenhagen to the west, Falsterbo to the south, the plain of Skane to the east, and Helsingborg to the north. Units one and two contain 4,000 m2 (43,000 sf) of office space distributed over 10 floors, with two elevators of their own. Units three through nine contain 147 apartments, varying in size from 45 m2 (484 sf) to 190 m2 (2,042 sf), for a total of 13,500 m2 (145,125 sf) of residential space. Each residential floor accommodates one to five residences, which all have their wet spaces (kitchen, bathroom) allocated near the vertical nucleus. The apartments are served by three elevators. At the top of unit nine, on floors 53 and 54, are meeting rooms. Each of these meeting floors has two rooms, one of which can be divided. 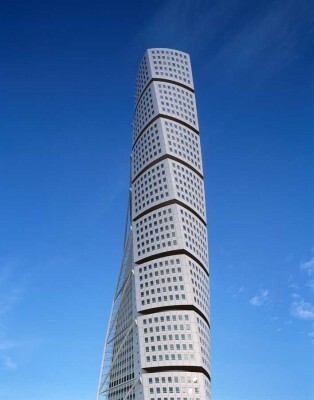 The foundation of the Turning Torso is a cylindrical box with a diameter of 30 m (98.5 ft) and a depth of 15 m (49.2 ft). The foundation slab rests on the limestone bedrock and has a depth of 7 m (23 ft). The main load-bearing structure is a circular reinforced concrete core, whose center corresponds exactly to the rotation center of the floors. The core’s inner diameter is 10.6 m (34.8 ft) and is constant. The thickness of the concrete is 2.5 m (8.2 ft) at the bottom and gradually tapers to 0.4 m (1.3 ft) at the top. Inside the core is the elevator and the staircase core, which is a secondary structural element. Strengthening and stiffening the core is an exterior truss: a painted steel column, which stands apart from the main body of the building like an external spine. This spine is attached to each unit by large diagonal and horizontal steel struts. These elements connect the spine to a structural wall at the top of the unit, transferring shearing forces to the concrete core. The spine itself is stabilized by pairs of smaller struts, which connect it to each floor of the unit. Floor slabs are made of cast-in-place reinforced concrete, built into the structural core and elastically supported by inclined steel columns located along the perimeter of the floor. Each unit has 5 flat slabs that are 27 cm thick (10.6 in). In addition, each unit has one cantilever conical slab (maximum thickness 90 cm, or 35 in) that transfers the loads of the floor columns to the structural core. The facade is made of approximately 2,800 curved aluminum panels and 2,250 flat glass windows. There are some 300 panels in each unit. Outside, the Turning Torso features a black granite reflecting pool and a granite entrance path. Granite is also used in some places within the building, notably in the lobby. A corridor located at first-floor level connects the tower to a secondary building, which contains the parking garage and support services. The entire building is handicapped accessible and features a highly advanced environmental design. Moreover, the engineering has allowed for an extraordinarily efficient method of construction. After the sub-basement was erected as a conventional concrete work, the vertical circulation nucleus and slabs were put up using a sliding framework system. The exterior steel structure was then attached, using elements that were prefabricated in the shop. Finally, cranes pulled up the in-shop, prefabricated facade. In this way, although the design is highly innovative, construction time was substantially reduced.